Select 4 stickers to make up YOUR own set 45mm Dia. Now that is easy and YOU have the CHOICE! Get Extra Copies and Save! Select 4 stickers to make up YOUR own set. A total of 96 stickers on 8 sheets of 12 stickers all personalised with teachers name. to make up your very own set and fill in order details above. 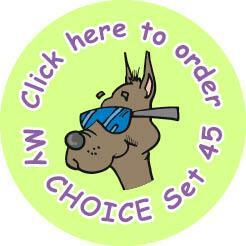 stickers and the 4 stickers for each My CHOICE Set 45mm! Add to cart and then come back for your next set!